Joe Lynn Turner was a victim of the 1985 belief that synthesizers were the way forward for music back then. Many of the songs on the album seem to be over dominated by it and on some of those things, I have always thought that they should have been turned down and the guitar turned up. Then the album would have been a real rocker. Don’t get me wrong, “Rescue You” is in no way an 80s synth pop album, there are some good rocking moments and on some tracks like the title track and the opener, “Losing You” you can definitely hear a bit of the old Rainbow on it. While the guitar on the title track is present, it is often obscured by the keyboard and for that song, I can’t help thinking how much I would be head banging away to it if the keyboards weren’t so dominant. Being a typical wishy-washy Gemini, (I don’t really believe that zodiac stuff), I think there are some tracks where the keyboards do work. The prime example here is the big single from the album, “Endlessly,” which was good enough to get to 19 in the singles charts while at the same time having metalheads shaking their heads and accusing Joe of going too commercial. The keyboard intro also works on “Feel the Fire” but as the song progresses, I again think they should have taken a back seat because this is another song that could have been great if the guitars had been turned up more. In spite of all my ramblings of too much keyboard, there are some tracks where Joe hasn’t lost touch with his hard rock roots. While the keyboards still exist on “Get Tough,” the song does rock and he also demonstrates that he has the pipes for such songs. This is another song that takes me back to his Rainbow days. In fact, the second half of the album is definitely more rock than the first. “Eyes of Love” is a fine example of this, it has a great guitar solo, but if you want concrete proof, the best track is the closer, “The Race is On.” This is the hidden gem because it just rocks with little interference from keyboards. With all my contradictions about guitars and keyboards on “Rescue You,” the one constant throughout the entire album is Joe Lynn Turner’s voice. Pretty boy or not, he has always had a great singing voice and deserves credit for it. The problem in 1985 was that the music industry was convinced that music had to have synthesizers to be any good. This belief had an effect on “Rescue You” for Joe Lynn Turner. Despite his great singing voice and the good quality of the tracks on the album, I can’t help thinking how much better some of the tracks would have been if there was less keyboard and more guitar. 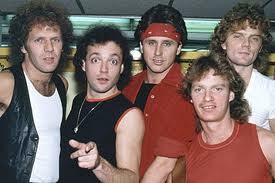 It’s back to the grindstone for the new year so in my case, it’s back to the tour of the golden decade of heavy metal. While, it wasn’t planned, I realized that it might be cool to start the new year off with a post from an album from one of the all time greats, ZZ Top. Thinking back to 1985, when I heard the first single from the “Afterburner” album, “Sleeping Bag,” I have to admit that I wasn’t too impressed. For me, that song was too synth pop and was too quick to accuse ZZ Top of selling out and abandoning their Texas boogie blues sound and wanting to sound like Duran Duran. Many other people I knew were of the same opinion. Fortunately, like I’ve said so many times throughout the history of the blog, one song doesn’t make an album. Slowly but surely, reports came in that the rest of the album wasn’t all synth pop and that Top hadn’t completely forgotten where they had came from. 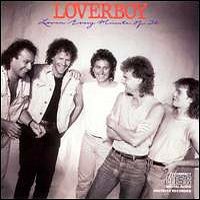 What convinced me that this was the case was the second single, “Rough Boy.” Even though some of Billy Gibbons’s great guitar work was shortened for the sake of radio friendliness, I realized that the reports from others were indeed correct. Thinking about “Rough Boy,” the full length version on the album is even better from what radio had to offer. True, the song is a bit of a ballad but if ballads had guitar solos like this one, then what’s the problem? 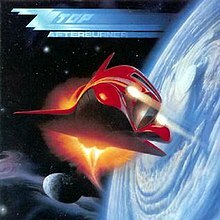 I will also not debate that there might be some synth pop sounds on “Afterburner” but for the most part, there is plenty of what ZZ Top had been famous for before hand. “Stages,” which was also released as a single and “Woke Up With Wood” bear testimony to that. If these tracks don’t convince you then “Can’t Stop Rocking” certainly will. This is a straight forward hard rocker that comes close to being a metal tune. Dusty Hill does the vocal duties here and he sounds fantastic and that leaves Billy to work more of his guitar magic and the result is pure magic. The second half of the album carries on where the first half left off. “Planet of Women,” (I would have loved to have gone there in 1985), gets my vote for hidden gem. It’s as hard rocking as “Can’t Stop Rocking” but what carries past the line for me is Billy Gibbons. His solos are just a little bit better on this track. Things continue in this vein for the rest of the album with “I Got the Message” but “Velcro Fly” does mark a slight return to synth pop, except Billy’s guitar solo is first rate. Then we get to the last two tracks where the links with the previous mega successful “Eliminator” album come through loud and clear. 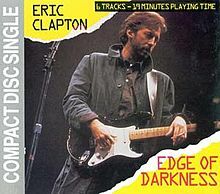 Penultimate track, “Dipping Low (In the Lap of Luxury) reminds me very much of “Give Me All Your Loving,” not a bad thing. The closer, “Delirious,” reminds me of “Bad Girls,” which was the closer from the “Eliminator” album. Maybe the band planned it that way because when the album closes, you are convinced that ZZ Top haven’t sold out and remain the band that they have always been. In conclusion, ZZ Top did not sell out with the “Afterburner” album. In fact, though I wasn’t impressed when I first heard it, “Sleeping Bag” has been growing on me more. It just proves how great this band has always been. Three days into 2019 and already two tragic deaths. 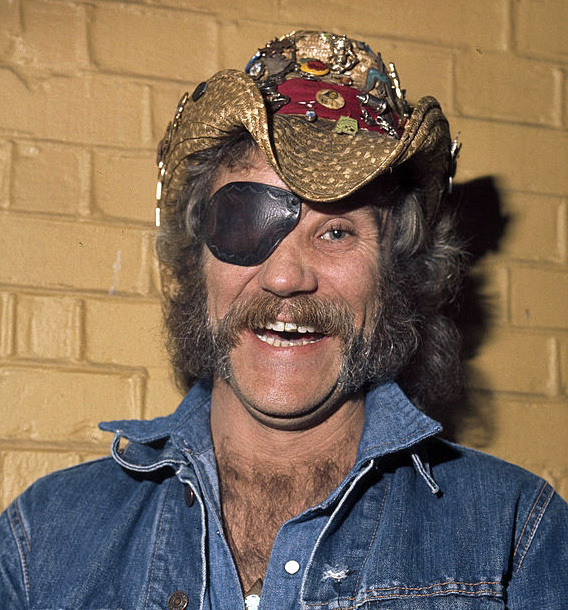 First, I read about former Dr Hook singer, Ray Stewart, famous for his eye patch, passed away quietly in his sleep at his home in Canada. He was 81. Dr Hook was famous for soft rock hits in the 1970s such as “When You’re in Love With a Beautiful Woman” and “Sharing the Night Together.” My personal favourite Dr Hook tune can be accessed at the bottom of this post. The second passing comes from the world of wrestling, which I was a big fan of in the 1980s. 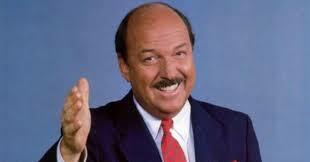 Former WWE commentator and interviewer ‘Mean’ Gene Okerlund passed away in Florida today. He was 76. I remember his unique commentary and interview style which will never be duplicated. With both heavy metal and synth pop polarizing a lot of musical tastes in 1985, many people claimed that they just wanted to hear some straight forward, old time rock and roll. For a lot of these people, the “Scarecrow” album from John Cougar Mellencamp gave them just that. I can’t really disagree with that thought. While I was firmly seated in the heavy metal camp back then, I still appreciated the no frills rock the album provided. It’s probably why the album made it to number two on the album charts. For the singles enthusiasts, “Scarecrow” netted five of them, all of which got inside the top thirty. This provides further evidence that many Americans wanted this type of straight forward rock. Because that is basically what the album is full of, eleven good no frills rock tunes. Okay, maybe the second track doesn’t qualify as such but the other ten for sure. The singles “Small Town,” “Lonely Ol’ Night” and “R.O.CK. in the USA” are still remembered and enjoyed today. All three are good steady rock tunes. Less remembered however, is my personal favourite, “Rain on the Scarecrow.” This dark song highlights the tragedy of American farmers at the time as many of them were going bankrupt and having their farms repossessed by the banks. I’m tempted to go into a political rant here but I’ll desist. What “Rain on the Scarecrow” did do for me was make me take John seriously as a song writer. Not being one to judge an album by its singles, I can safely say that the rest of the album holds up well. Even though “Justice and Independence 85” and “Minutes to Memories” were never released as singles, they still made it onto the Hot Tracks Chart and I can see why. Furthermore, John’s more topical songwriting features in the former of the two and continues with “Face of a Nation” where he sings about the poverty and homelessness that was happening in the mid 1980s at the time. 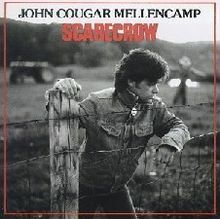 What I conclude here is that John Cougar Mellencamp’s more developed songwriting combined with straight forward rock, which a lot of Americans were craving for at the time, combined to make “Scarecrow” probably his best album at the time. In a 1985 that seemed to be polarizing musically, it was a relief to many that there could be straight forward rock around at the time. 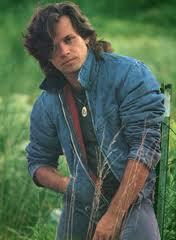 Not only would John Cougar Mellencamp release a top album, he would go on to arrange a benefit concert to help America’s bankrupt farmers but that’s a story for another time.